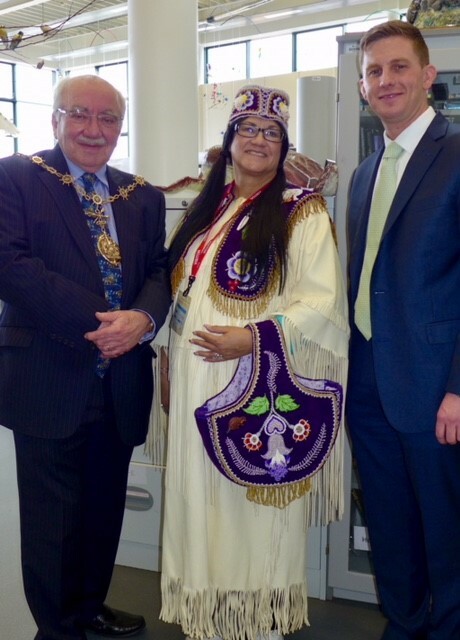 St George’s in Gravesend was delighted to welcome two visitors from the USA who flew over to speak on the 401st anniversary of the death of Princess Pocahontas. Pocahontas died in the town after being taken ill on her journey downriver from London on 21st March 1617. She was buried at St George’s and the parish register of the time records her interment. Jamie Bosket, on his first visit to Gravesend, is the President and CEO of the Virginia Museum of History and Culture, responsible for some nine million artefacts as well as an iconic building in Richmond VA. It was the third visit, however, for Chief Anne Richardson of the Rappahannock Tribe. Chief Anne first came to the town, together with other tribal chiefs, in 2006 and has memories of the time as one of great healing. She was also present for the 400th anniversary last year. Both Chief Anne and Jamie spoke on the same theme, The Many Faces of Pocahontas, to an appreciative audience of around one hundred in St George’s Church. Jamie focussed on artistic representations of Pocahontas, mentioning that there was only one image made of her in her lifetime – an engraving of 1616 by the artist Simon de Passe. Other pictures showed different events in Pocahontas’ life, including her saving the life of the English settler, John Smith, her baptism, and her marriage to John Rolfe. Such was her influence that Pocahontas is to be found among the historical figures in the paintings adorning the rotunda of the Capitol building in Washington DC. Jamie also mentioned the statue which has been in the churchyard of St George’s since 1958, a copy of one from the 1920s to be found in Jamestown, site of the original English settlement. Whilst Jamie’s focus was on the physical images of Pocahontas, Chief Anne’s was on her spiritual impact. In speaking of the sort of person Pocahontas was, Chief Anne drew inspiration from the figure of Ruth in the Old Testament. Indeed, of the two ‘Pocahontas’ windows in St George’s, given in 1914 by the Colonial Dames of Virginia, while one features Rebecca (the name Pocahontas took at her baptism) the other depicts the story of Ruth. In particular, looking back at Pocahontas’ life, Chief Anne emphasised her evident dedication to peace and reconciliation. For Chief Anne, those are the two qualities that, more than any others, have made Pocahontas such an enduring figure. ‘If George Washington was the ‘father’ of America’, she concluded, ‘then it is Pocahontas who was the ‘mother’’.